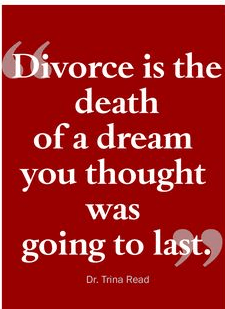 Divorce is the death of a dream that you thought would last. It’s been two weeks since the divorce and I don’t care what you say I think divorce is taking the easy way out. You asked what do I mean. I mean its a lot of hard work to keep a marriage. At one point you said I do until death do us part. your spouse said the same thing. I don’t care if they wanted the divorce or you wanted the divorce it still takes two to make the marriage work. I fought tooth and nail to keep our marriage together or to resolve our differences. In this blog post I’m not placing blame on you or your spouse. If your divorce is official / final then I want to help you give you some tools to make it through to the next step. Number one tool is to pray. now before you say praying did not save my marriage , I thought the same thing and felt the same way. We will address the topic of prayer in another blog post. Number two tool surround yourself with some positive people. I’m not talking about surrounding yourself with friends who bash your spouse with you. At this point I’m talking about some friends that are going to support you in moving forward. Number three tool find a support group. Yes there’s actually a support group called divorce care very few people know about it but it does exist. This blog post is not intended to give you all the answers of course no one can give you all the answers today. For myself I just had to look in the mirror and say ok that chapter is over what is next. You and I realized that we are not the only ones whoever got a divorce we are not the first ones and we will by no means be the last ones so the question is now that is happened what are we going to do in the next chapter of our life.